What do Benedict Arnold and bootleggers have in common? A great deal as it turns out. Both made a good living as smugglers here in the St Croix Valley, both were detested by a large portion of the population but protected from arrest by influential citizens and both lived in daily jeopardy of capture by the authorities, in Arnold’s case for treason. The photo above, taken in the 1880’s, is the home Arnold built on Campobello after the Revolutionary War. Following his failed attempt to turn West Point over to the Brits during the revolution, Arnold fetched up in St. John NB which was prospering at the time as the smuggling capital of eastern Canada. While he lived in St John he spent much of his time in Campobello overseeing his business and we have an account of him traveling to Robbinston to do some business which one would have thought rather risky given his fugitive status. He eventually wore out his welcome in St John as he had a reputation for being prickly and quick to go to court. He was not well liked for that reason more than anything else, and eventually went off in a huff in 1792 to England. Saint John breathed a collective sigh of relief. 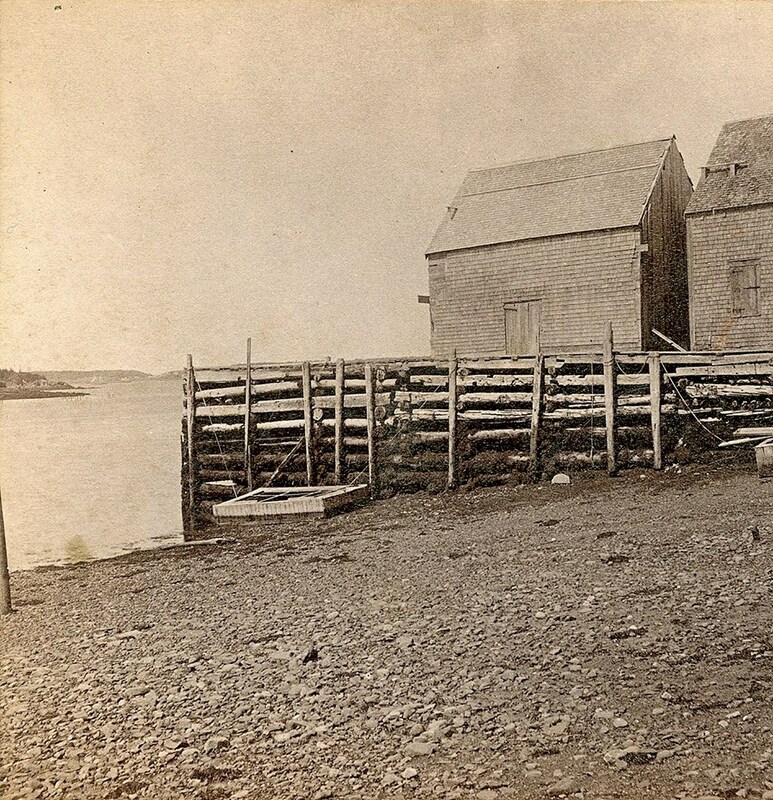 “While at St. John, Arnold loaded vessels with timber at Campobello, opposite Eastport, and made his headquarters at Snug Cove, and it must have been at this time that he had dealings with Col. Allan. Capt. John Shackford, who was one of the original settlers of Eastport served as a soldier under Arnold in that terrible march through the Maine wilderness to the walls of Quebec, and in spite of the want of sympathy which such a staunch patriot would have for such traitor always retained a kindly remembrance of him. 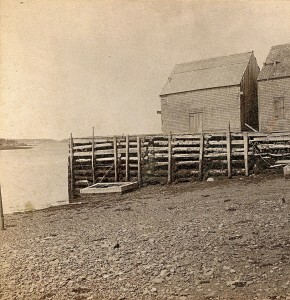 Once when Arnold was loading a ship at Campobello, he sent to Moose Island (Eastport) for men to help in the work, and Shackford was among those who went over for that purpose, and he used to relate that when at rest after his meals he frequently seated himself on the deck of the ship to watch the movements of his old commander for whom courage and military skill he still retained admiration. “Tears,’ he said, ‘sometimes came, and I could not help myself, he carried us through everything, and I could not help thinking of him as he was then.’ It is not remembered that he made himself known to Arnold, who soon after went from the neighborhood and removing from St. John to London, died there in 1801.” Up the river in Calais smuggling was not an issue in those early days of settlement because the citizens seemed blissfully unaware that the border was anything other than an occasional physical impediment to free trade. There were no bridges at the time but as compensation there was also no law so goods and people flowed unhindered across the St Croix by boat. With Jefferson’s Embargo Act of 1807 which prohibited trade with the British colonies, revenue agents arrived and made sporadic futile attempts to at least slow the rampant smuggling. The illustration above depicts smugglers from St Stephen approaching the Calais shore and is from Frank Leslie’s Illustrated Newspaper based in New York City. The caption below the illustration reads: Government Officers Waiting and Watching for the Arrival of Smuggling Boats from the New Brunswick Shore. 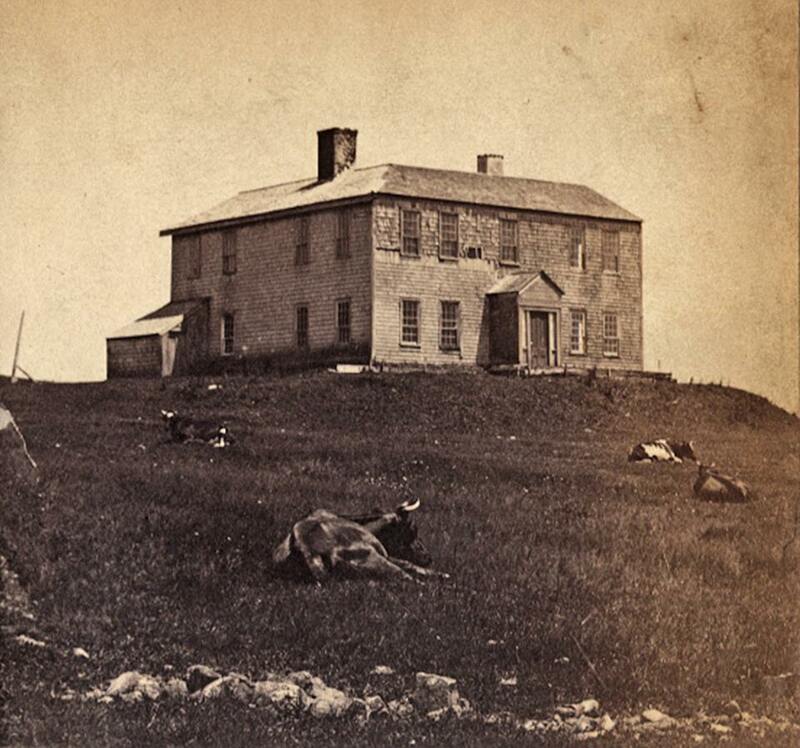 National publications often carried stories about lawless Downeast Maine. 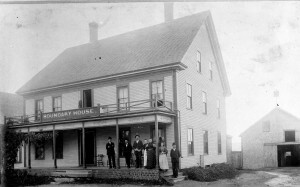 Milltown Maine was a hotbed of illegal activities in 1800’s and there was not a smugglers nest more notorious than the Boundary House on the riverside of North Street in Milltown. The old county records contain reference to Sheriff’s raids on the establishment. It was situated just beyond Knight’s Corner going into Milltown and before the Baptist Church at the entrance to Bridge Street, the sign for which still exists although there is no longer a street. From very early days Bridge Street led to the Arch Bridge which connected Milltown with the area in Milltown NB where the Cotton Mill was built.Bridge Street began just to the right of the Boundary House. This photo shows the Arch Bridge, just down the river bank from the Boundary House, connecting to the mills below Knights Corner in 1897. Because it was not a main bridge and was allegedly only to provide access to the mills it was largely unregulated and ideal for smuggling. The Cotton Mill would have been just downriver to the right.To the right of the Arch Bridge is Murchie’s millyard which cannot be seen in this photo because of the steep bank on Knight’s Corner but it is shown in the next photo. 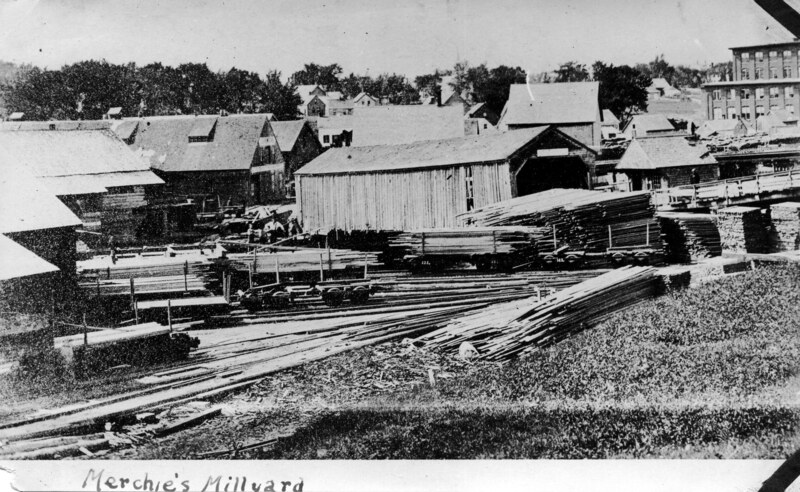 This is Murchie’s millyard below Knight’s Corner, the Cotton Mill is to the right. 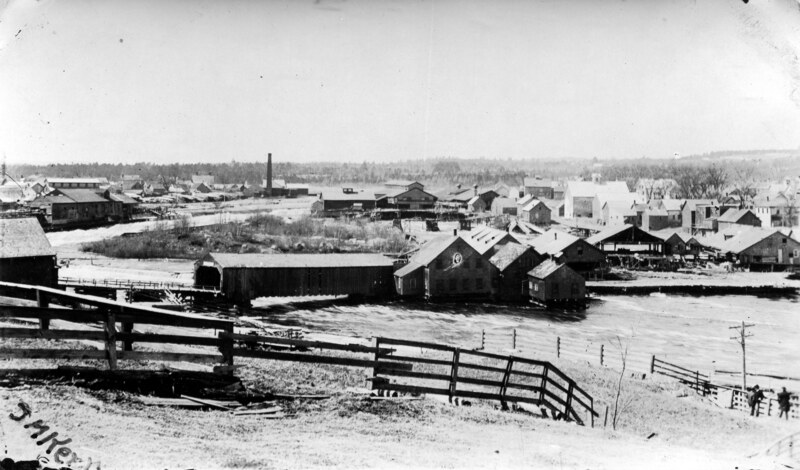 The mills stretched entirely across the river from the US shore to Milltown NB. It was impossible to stop lumber from Canada or anything else for that matter being freely transported from one side of the river to the other and it was very profitable to do so. 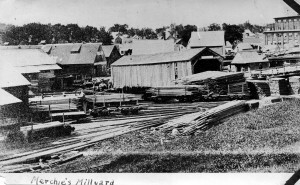 Lumber shipped from Canadian mills was subject to high English duties but was duty free if shipped from the Calais side. Vain attempts were made now and again by revenue agents to stop the smuggling. There exists an account in 1837 of a customs seizure by Customs Officers at the Arch Bridge just below the Boundary House, based on a tip from an informant. A group of concerned citizens from both sides of the border thought it only right and proper that the name of the informant be made public in order that some remedial education on the economic realities on the river be given this, as the Calais Advertiser described him, “odious villain”. 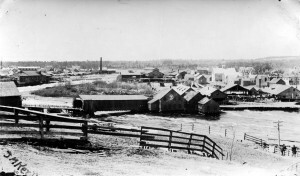 The Customs Officers refused to divulge his identity whereupon the citizen group, disguised as Indians, kidnapped the pair and escorted them across the river to a pine grove at the rear of the William Todd residence inMilltown NB. 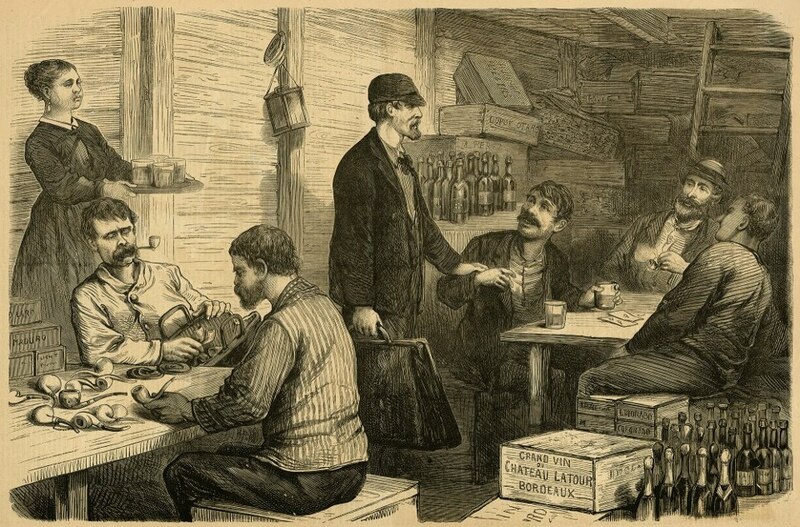 A lengthy discussion ensued between the “Indians” and the Customs Officers, and menacing scenarios were advanced as to the fate of the officers should they refuse to yield the name but in the end the “Indians” went home without the informer’s name and the Customs Officers without injury. 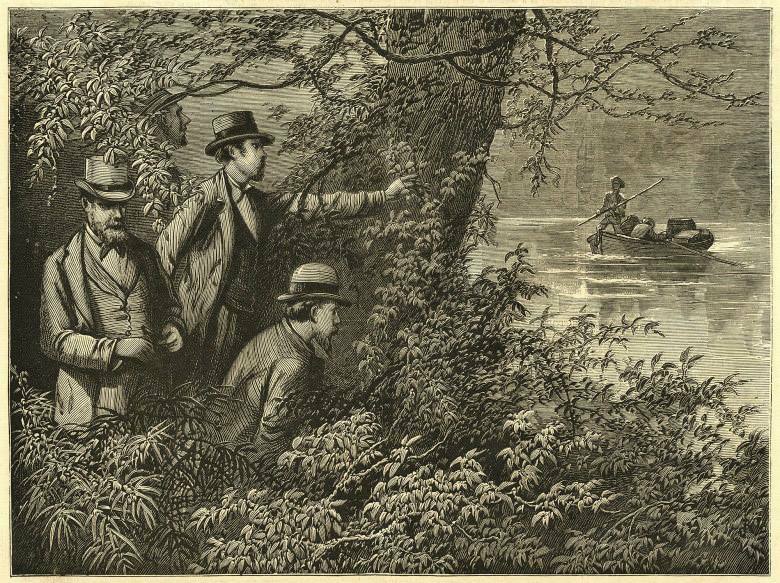 The affair caused a stir, the militia on both sides of the river were called out but the newspaper reported “Order was soon restored, but none were ever brought to justice. The actors in the affair were men of immense muscle. They were the very hardiest race of men in existence.” I’m sure some of these men of muscle had close connections the Boundary House. It is important to note that the Calais Advertiser described the informer as an “odious villian” which provides some insight on how important “smuggling” was to the local economy. Of course the smuggling of large quantities of lumber was the province of the 1%ers, the Todds, Eatons and Murchies. Everyone else smuggled whatever was cheaper on the other side of the river or, in the case of alcohol, what was legally available on the other side. The illustration above from a national magazine shows a nighttime scene in a nineteenth century smuggler’s headquarters near Calais. 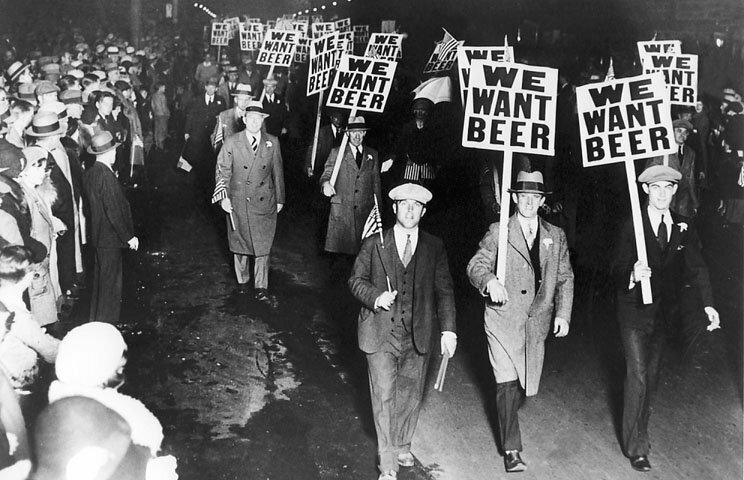 Prohibition arrived early in Maine, the first prohibition laws in 1851 with a complete prohibition on the sale or possession of alcoholic beverages becoming law in Maine in 1881, the first such law in the nation. As the Canadians continued to believe a tot of rum was good for what ailed you, we had a problem here on the border. It was easily solved however when our kind neighbors across the river agreed to share their booze with us and, if they ran short, they would simply import it by the boatload from the West Indies or, in later years when national prohibition became law, Belgium and other European distilleries. It was very easy to move the contraband from the Canadian side and nearly all the hotels and inns would provide a wee dram to the thirsty traveler if the owner were discreet. Raids by the Washington County Sheriff were rare and even more rarely a surprise and some innkeepers ever advertised as can be seen above. 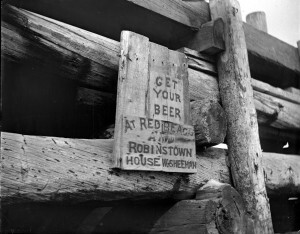 The sign makes clear that Mr. Sheehan of the Robbinston House would be happy to provide a beer with your meal and it was understood the meal was optional. 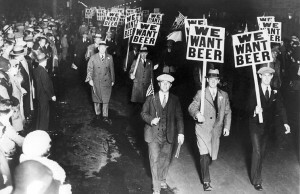 That is certainly what these fellow wanted as they protested the enactment of Prohibition but protest were unnecessary in the St Croix Valley. With a strong arm there were places on the river where a bottle could almost be thrown to the other side. This wasn’t how it was done however.